The formidable fortified walls of Assisi can be seen from a great distance as the city is approached from any direction. 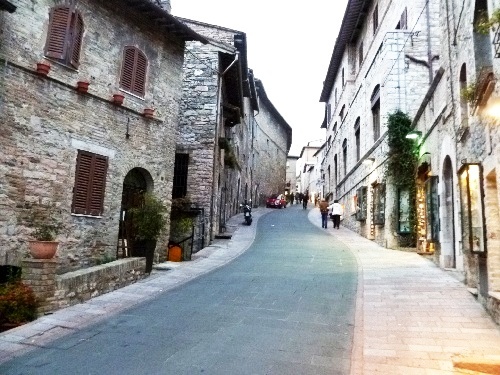 Assisi is situated high on the slopes of Mount Subasio in the province of Perugia in the Umbria region of central Italy. 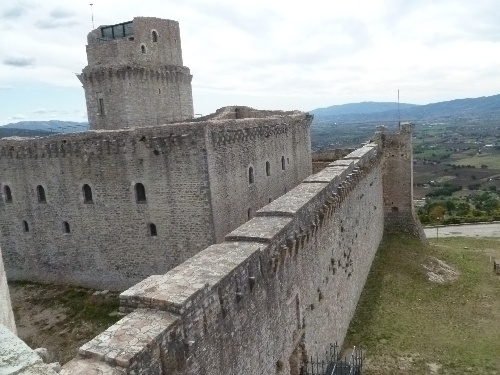 The high walls of Assisi and the Rocca Maggiore castle provide evidence of the military struggles that were needed to protect the city from armed invaders in medieval times. 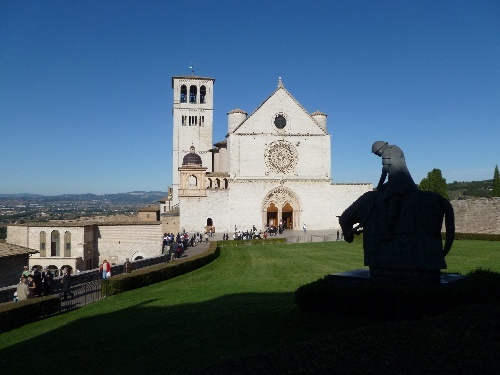 Today, Assisi is a popular destination for tourists who want to see vestiges of the Roman civilization that established Assisi and for pilgrims who visit the churches and relics of Saint Rufino, Saint Francis and Saint Clare. 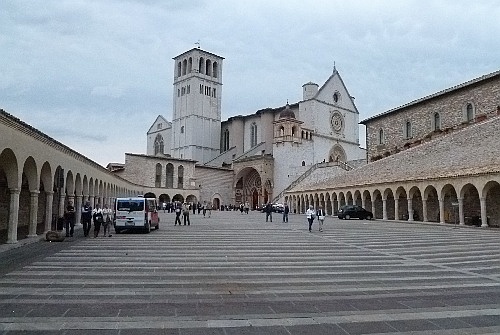 The city of Assisi originated before the Christian era. The Umbrians started establishing small fortified settlements on high ground around 1000 BC. These settlements were gradually taken over by the Etruscans starting in 450 BC. The Romans took control of central Italy in the Battle of Sentinum in 295 BC and eventually built a prosperous municipium called Asisium on terraces constructed on the western flank of Monte Subasio. The city walls of Assisi and the Temple of Minerva are some of the remains of the Roman culture and architecture that can still be seen today. 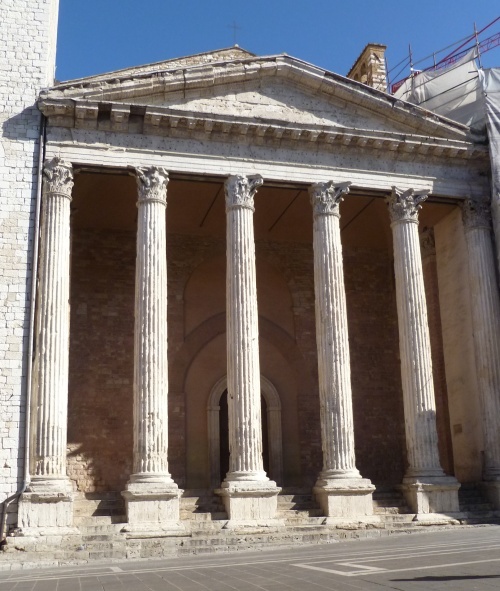 The Temple of Minerva with its classical columns has been converted into the Catholic Church of Santa Maria sopra Minerva. 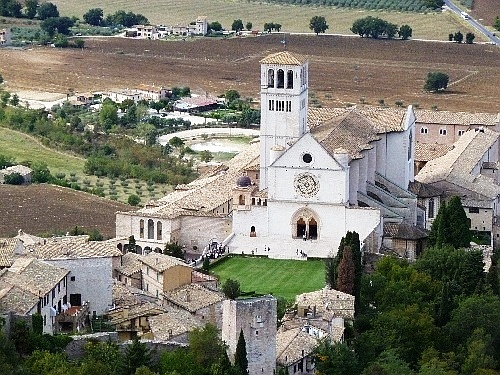 In 238 AD, almost 140 years before the Roman Empire adopted Christianity as the state religion, Bishop Rufino converted the inhabitants of Assisi to Christianity. 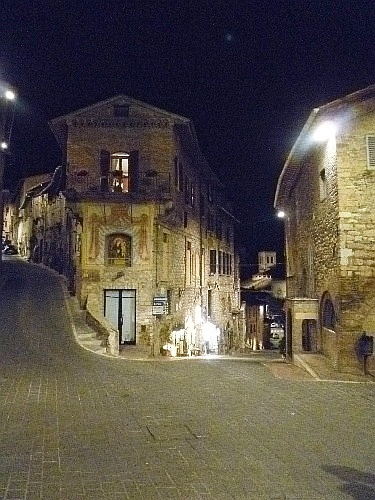 In the 12th century, the cities of Assisi and Perugia were constantly feuding. During one of the battles, Francesco di Bernardone (Saint Francis of Assisi) was taken prisoner, and his imprisonment was instrumental in giving him a new perspective of life that led him to renounce worldly possessions, live as a beggar, and establish an order of friars. In the 13th century, the city of Assisi expanded beyond the Roman walls, and the dilapidated Rocca Maggiore fortress built in 1174 was restored. In 1348 the Black Death devastated the city and many years passed before the population and commerce recovered. The Renaissance started a period of peace and prosperity during which important architectural structures were built in Assisi. Giovanni Francesco di Bernardone was born in 1182 to a wealthy cloth merchant in Assisi. 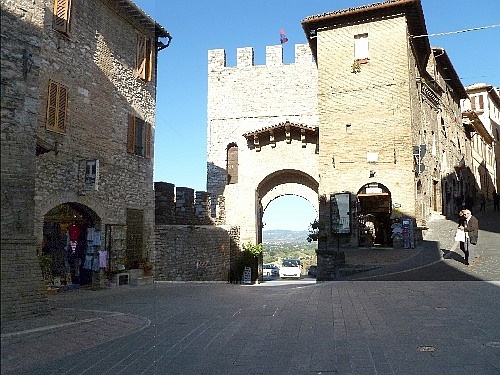 As a young man, Francesco enjoyed the easy life of a privileged person, but he also took part in the battle of Collestrada between Assisi and Perugia in 1202, in which the Assisi forces were captured and taken prisoners. After a year in prison, Francesco was ransomed by his rich father. It took Francesco more than one year to recover from the health problems that had made him ill in prison. When he felt better, Francesco went to Spoleto in 1204 with the idea of becoming a knight and joining the fourth Crusade, but after a restless night of visions and dreams he returned to Assisi to the scorn of his father and friends. 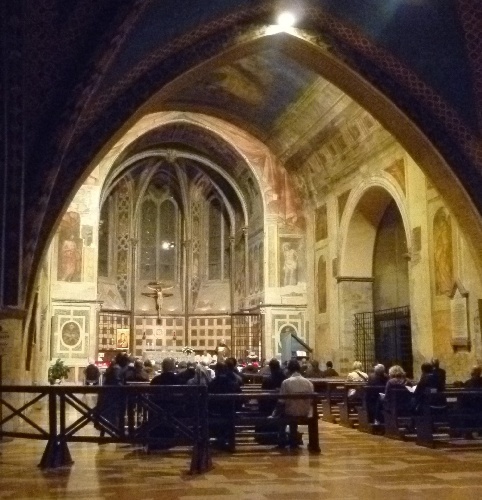 In 1206, Francesco began a mendicant life while trying to repair the church of San Damiano. Francesco began preaching in the streets, and soon had many followers. The Franciscan order was endorsed by Pope Innocent III in 1210. Francesco also founded the women’s Order of St. Clare. Francesco died on October 3, 1226. Pope Gregory IX pronounced him a saint on July 16, 1228. Construction of the basilica started in the same year and it was finished in 1230. An addition called the Upper Basilica was begun after 1239 and was completed in 1253. "Go back to your city and you will be told what you must do"
At the break of day, Francis, with his reformed inner self, desired only to conform to the will of God. 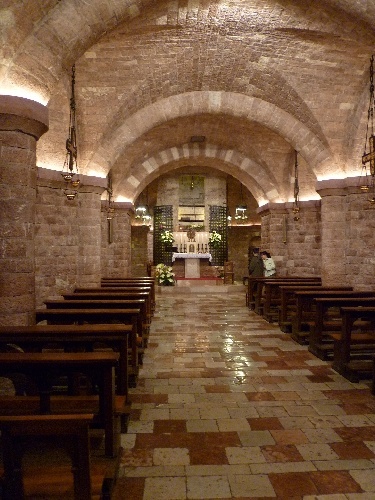 In the evening, as the Franciscan friars get ready to close the church, they descend into the crypt that holds the tomb of St. Francis and start to pray. Gregorian chants and incense fill the air. At the end of the veneration of St. Francis, the monks file into their quarters for the night, and all visitors are asked to leave. Rufinus of Assisi was the first bishop of Assisi in the 3rd century, and he was responsible for converting the people of Assisi to Christianity. After he was martyred and canonized, Saint Rufino became the patron saint of Assisi. Construction of the Umbrian Romanesque style cathedral to honor Saint Rufino was started in 1140. Saint Francis and Saint Clare were both baptized in this church. 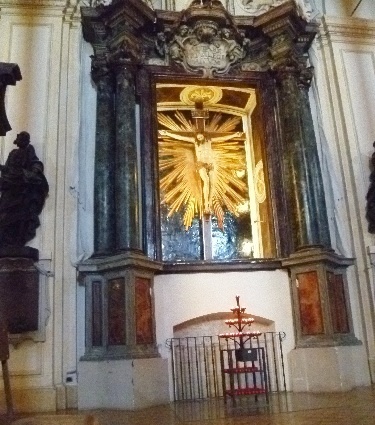 It was also in this church that Claire was inspired by the sermons of Francis in 1209. 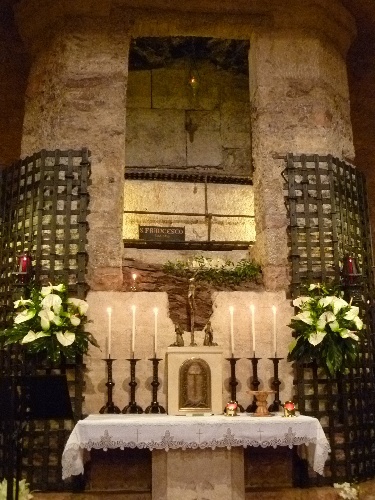 The remains of Saint Rufino are located under the main altar of the Cathedral. The Museo Diocesano e Cripta di San Rufino (Museum of the Cathedral and Crypt of San Rufino) was opened in 1941 under the cathedral. 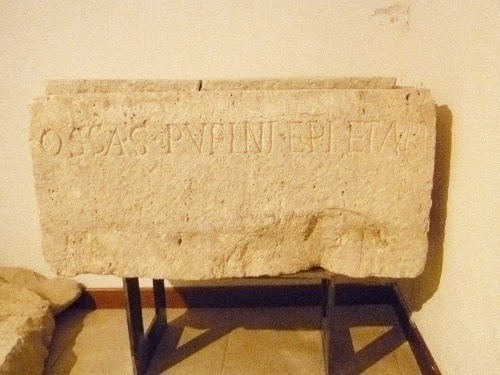 The museum has a crypt with a Roman sarcophagus from the 3rd century that once contained the remains of Saint Rufino. 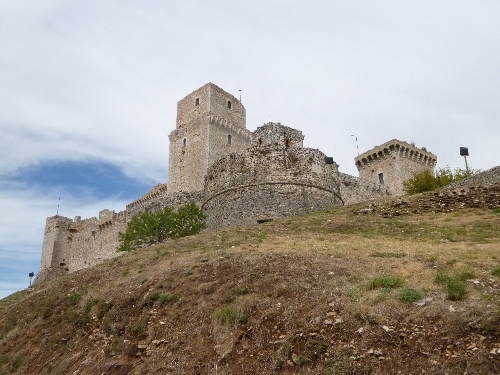 Almost a thousand years old, the Rocca Maggiore is a powerful military fortress, witness of bloody encounters, long sieges and strenuous defense, whose proud fascination has been kept intact over time. Its famous inhabitants, lords of the fortress, mercenary soldier leaders and perhaps even an emperor, contributed to create an evocative, mysterious aura which still hovers around its walls. Built on the summit of the hill, in a strategic defense point with a 360° view of the territory around it, Rocca Maggiore offers its visitors one of the most beautiful landscapes of the Umbrian Valley. 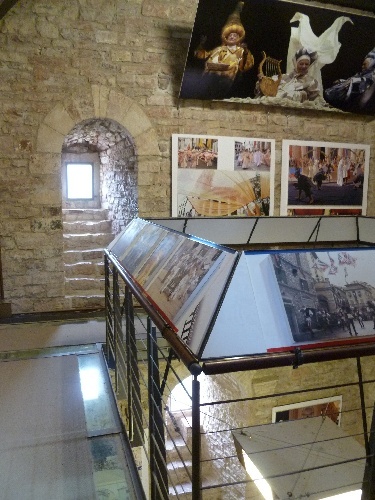 People subject to claustrophobia and vertigo should not visit the Rocca Maggiore. 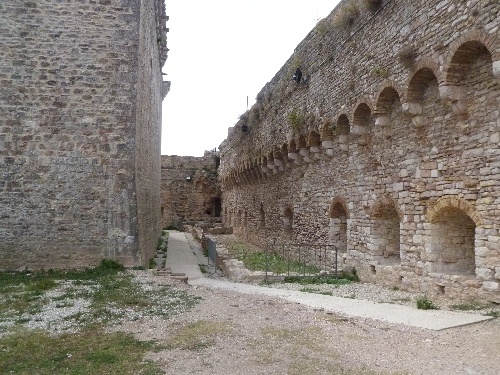 Testimone di quasi mille anni di storia, la Rocca Maggiore di Assisi è una poderosa fortezza militare, teatro in passato di scontri sanguinosi, di lunghi assedi e strenue difese, che ha mantenuto intatto nel tempo il suo fascino fiero. Gli illustri personaggi che l'hanno abitata, castellani, capitani de ventura e forse anche un imperatore, hanno contribuito alla formazione di un'aura evocative e di mistero che tuttora aleggia tra le sue mura. Costruita sul culmine del colle, in un ponto strategico per la difesa della città osservatori a 360° sul territorio circostante, la Rocca Maggiore offre ai visitatori uno dei più bei panorami della Valle Umbra. The powerful outline of the Rocca Maggiore has been looking over the city of Assisi for almost a thousand years. The fortress was built for defensive purposes around 1174, when Archbishop Cristiano di Magonza took over the city on behalf of Frederick Barbarossa. Legends say that Frederick II himself stayed in the fortress, under the care of Corrado di Uslingen. In that same year, however, while Corrado was away, the residents of Assisi besieged the Rocca, which was a symbol of the despotic dominance of the Swebas and of the old feudal class, and virtually destroyed it. 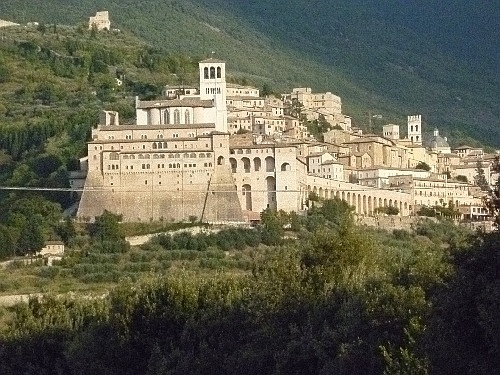 In 1205 the budding Commune of Assisi was promised by Philip II that no other fortress would ever be built there again, but only one and half century later, in 1367, Cardinal Egidio Alvarez de Albornaz, whom Pope Innocent IV had trusted with the reestablishment of pontific power in central Italy, ordered the reconstruction of the fortress. In the following years, the Rocca was enlarged to add dormitories for the militia, service rooms and prisons. Between 1458 and 1459, Jacopo Piccinino, built the polygonal tower and the wall that connects it to the castle. These works were concluded by Pope Pius II. In the 16th century, under orders of Pope Paul III, the round rampart was built, giving the fortress its current aspect. The fortress was damaged and repaired according to the shifting powers over the city of Assisi, and in 1600 it was abandoned and looted. In 1883, the Commune of Assisi bought it back from the government and 1891 saw the beginning of its restoration which continues to this day. The fortress served as the setting for Zeffirelli's 1972 film "Brother Sun, Sister Moon" that dramatizes events in the life of St. Francis of Assisi. 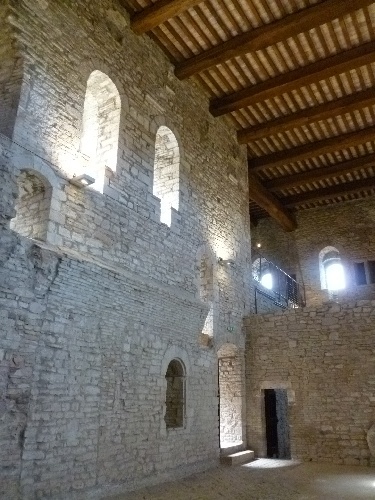 Access to the North-West Tower is now possible by means of a modern spiral staircase. In the past, the towers were equipped only with retractable ladders which could be promptly removed in case of danger of attacks. The tower offers a clear view over the valleys around the hill and particularly over the Tescio valley. 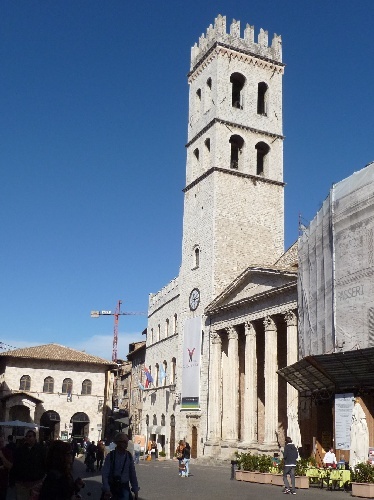 The Polygonal Tower and the wing which connects it to the Fortress were commissioned by Jacopo Piccinino, a Perugian warlord who gained control of Assisi in 1458. His aim was to fortify the western side of the fortress and to obtain a better observation point over the valley around it. 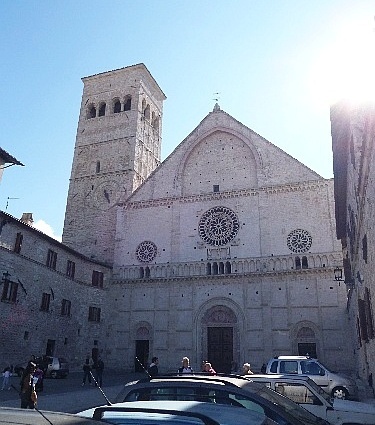 This military building was completed by Pope Pius II, with whom Piccinino exchanged the city of Assisi for money. The Polygonal Tower is reached by descending twelve steep steps that eventually penetrate the adit inside the walls. This 105-meter tunnel has numerous view ports that provide strategic glimpses of the landscape. At the end of the long and narrow covered walkway, a stone spiral staircase leads up to the summit of the Polygonal Tower. The fortress of Assisi was rebuilt in 1365 on the site of an older structure, by order of Cardinal Egidio Albornoz, who installed a garrison to defend the city. 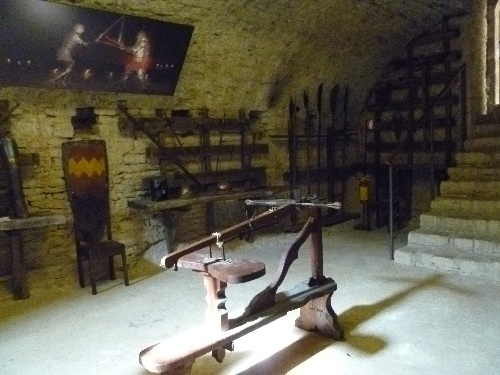 The castle has an exhibit of the weapons and armor that were used before the introduction of gunpowder. The crossbow was the weapon most commonly used because it had a larger range than the bow. The crossbowmen could easily take aim at archers and cavalry who were still too far away to be able to hit them. Furthermore, the mechanical device to hold and release the string meant less strength and skill was required to use the weapon. However, the crossbow could be fired and reloaded less rapidly than the bow and its use was limited to situations in which either a shelter or at least archers were available to cover the crossbowmen while they reloaded. The halberd and spear were the most commonly used weapons to hold off a head-on attack from cavalry. The halberd is a long pointed spear topped with an axe blade that has a hook on the back side. It can be used for hacking, piercing, and hooking horsemen to unmount them. To hold off the cavalry and in direct battle two weapons were used: the morning star (or mace) with a spiked metal ball, and a flail, consisting of a wooden handle on which is fixed a chain ending with a spiked metal ball. Duels were usually fought with swords, generally held with two hands to stab. The exhibit in the castle includes some armor from the fourteenth century made from sheets of metal fastened by belts and buckles to linen or woolen military corsets and completed by chain mail headdress, camail, and gloves to cover every part of the body with metal protection. The helmet completed the knights' attire.